BNSF has completed installation of all mandated Positive Train Control (PTC) infrastructure on our network. We are operating trains with PTC protections on the mandated lines as we continue to test and refine this highly complex system. 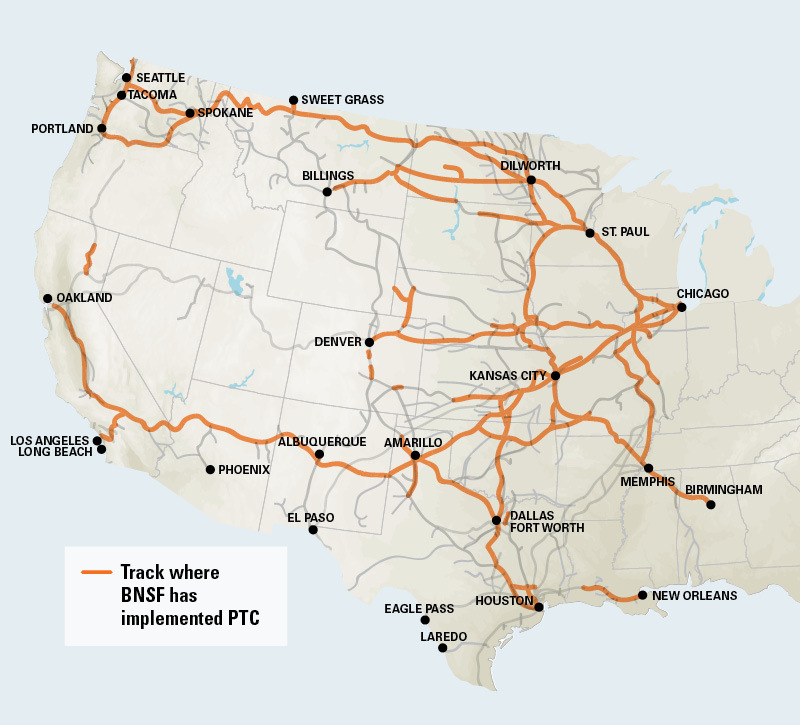 As per the federal mandate, BNSF has installed the PTC infrastructure on all 88 required subdivisions, covering more than 11,500 route miles and 80 percent of our freight volume. We are also installing PTC technology on subdivisions beyond the mandate. We are running more than one thousand trains daily with PTC as we test operating in revenue service across our entire mandated territory. On June 13, 2018, BNSF announced that we nonetheless submitted a request to the Department of Transportation (DOT) for a two-year extension of the PTC deadline. The Federal Railroad Administration (FRA) approved the extension request in September 2018. The December 31, 2020 extension is required due to the FRA’s current interpretation of the law that full implementation status cannot be achieved until all non-BNSF trains and/or equipment operating on our PTC-equipped lines are also PTC-compliant. See the full story behind the extension request. These metrics represent where BNSF stands in some key areas as of December 31, 2018. They are derived from BNSF’s quarterly PTC progress report to the Federal Railroad Administration (FRA). Here’s more information about BNSF’s request for a PTC deadline extension. What is the deadline to implement PTC? The Rail Safety Improvement Act of 2008 mandated that PTC technology be installed and operating on routes that carry passengers and/or toxic-by-inhalation (TIH) commodities by December 31, 2015. In late 2015, under the Positive Train Control Enforcement and Implementation Act, Congress extended this deadline for all railroads by at least three years to December 31, 2018, with the possibility of an additional two years (December 31, 2020) for testing and fine tuning an already installed and at least partially operational PTC system. How has BNSF complied with this mandate? BNSF was the first U.S. Class I railroad to complete our implementation plan. At the end of 2017, BNSF completed installing the PTC infrastructure on all 88 required subdivisions, covering more than 11,500 route miles and 80 percent of our freight volume. BNSF has operated approximately 2 million revenue service trips under PTC, providing another layer of safety to our already robust safety program. We are currently running more than one thousand trains daily with PTC as we continue to refine the system and resolve technological challenges. Why is BNSF filing for an extension? 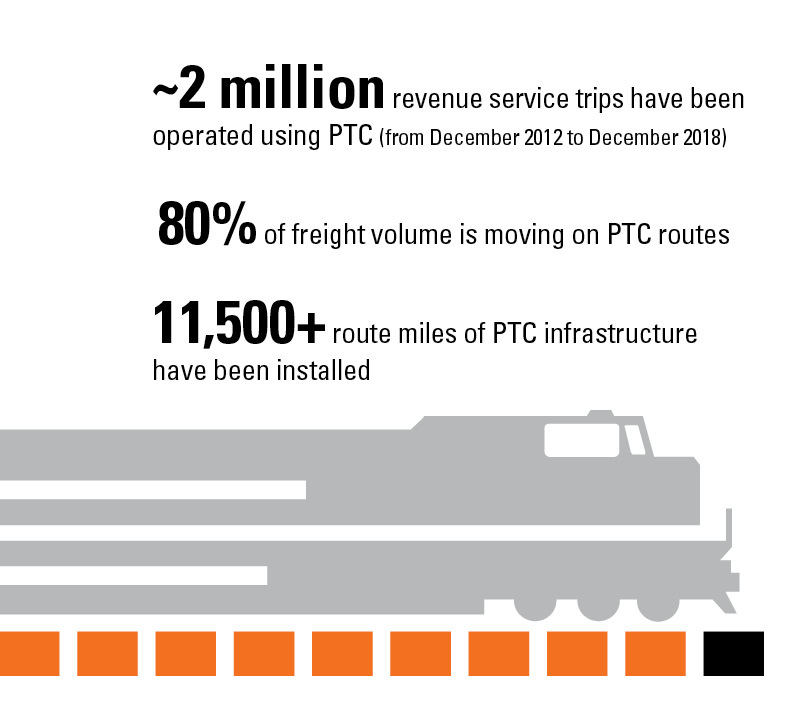 While BNSF has met the deadline for PTC implementation, other railroads, including commuter and short line carriers, operate trains across BNSF’s PTC-equipped lines every day. The December 31, 2020 extension is required due to the Federal Railroad Administration’s (FRA) current interpretation of the law to mean that full implementation status cannot be achieved until all non-BNSF trains and/or equipment operating on our PTC-equipped lines are also PTC-compliant. This interoperability of PTC systems between Class I, commuter and short line rail carriers remains a challenge. 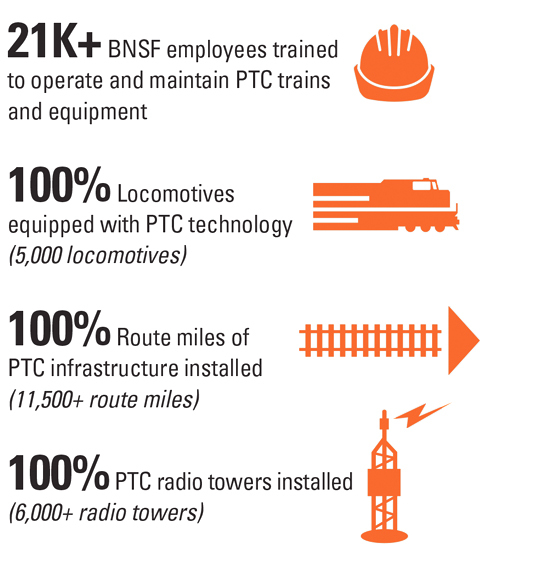 In regards to PTC implementation, interoperability means that all railroads operating across any of BNSF’s PTC-equipped lines must be capable of operating with BNSF’s PTC system. BNSF has already demonstrated interoperability with some short line railroads and several passenger railroads, including commuter railroads and Amtrak. BNSF is leading the North American freight rail industry with PTC interoperability. We are actively working with each of the approximately 30 railroads with which we need to be interoperable to identify their needs and how we can be of help. This assistance ranges from technical, operational and regulatory advice to a variety of services such as back-office hosting and crew training. We have achieved interoperability, and PTC is active for several passenger railroads, including Amtrak, Metra, Metrolink, Northstar and Sound Transit where they run on BNSF. This is an important achievement because one of the primary purposes of PTC is to provide protection where railroads run freight and passenger service. We have also accomplished interoperability with short line roads Montana Rail Link, Louisiana & Delta Railroad and Dakota, Missouri Valley and Western Railroad. We look forward to expanding interoperability and will continue to work with the FRA to ensure PTC enhances rail safety wherever it operates. Derailments caused by excessive speed. Unauthorized incursions by trains onto sections of track where maintenance activities are taking place. Movement of a train through a track switch left in the wrong position. Ensure the train does not exceed its authority. Determine the location, direction and speed of the train. Take action by stopping the train if there is not a response by the train crew. Onboard Locomotive System: Monitors the train’s position and speed and activates braking as necessary to enforce speed restrictions and unauthorized train movement into new sections of track. 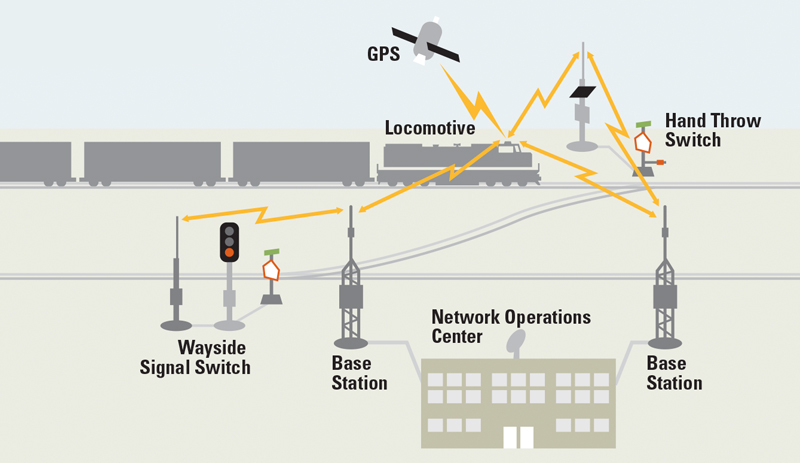 Wayside System: Monitors railroad track signals, switches and track circuits to communicate movement authorization to the locomotive. Back Office Server: The storehouse for all information related to the rail network and trains operating across it. It transmits the authorization for individual trains to move into new segments of track.